DUFC's five-game winning streak came to an end on Sunday, as fellow high-fliers Barnhall triumphed 43-14 in Santry. 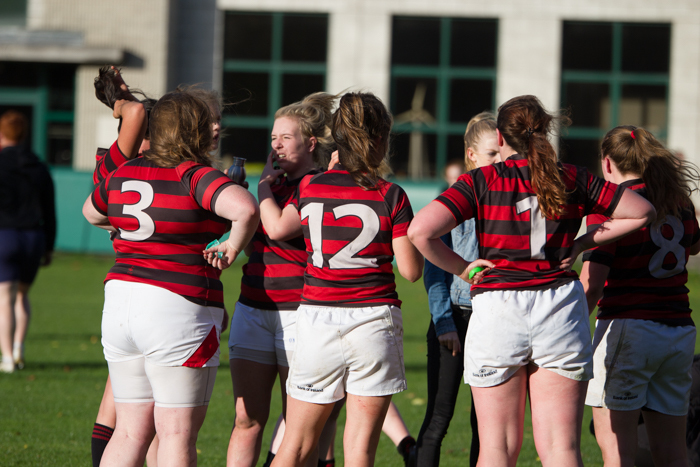 In a top-of-the-table clash between two sides vying for top spot in Division 3 of the Leinster League, Dublin University Football Club (DUFC) Women came up short against a tough Barnhall side on Sunday, losing out 43-14 in Santry. The defeat brought to an end what had been an impeccable start to the season for Trinity, during which they had notched five wins from their opening five games. Within minutes of the opening whistle, Trinity was on the back foot, with aggressive attacking from the visitors keeping them under the cosh. Despite the leadership shown by captain Jane Leahy and Niamh O’Kelly Lynch, DUFC frequently found themselves breaking ranks to resist the battering to which Barnhall’s Katelynn Doran subjected them. Forced to be compact in defence, Trinity had no outlet when they did secure possession, meaning players were left with little room for manoeuvre and were quickly brought down. Some rusty Barnhall passing kept the onslaught at bay. Eventually, Trinity’s defence faltered and a dropped ball led to Barnhall’s first try in the 11th minute. Despite this, Trinity bounced back and started to get some momentum in their offensive plays. Leahy and Genevive Reusch pulled off some particularly successful runs, making significant progress into Barnhall’s half. However, it was not to last. Doran, picking the ball up on the halfway line, set off on a stunning break, weaving through DUFC’s defensive line and planting the ball right between the posts. A successful conversion brought the score to 12-0 to Barnhall. The ensuing minutes were frustrating ones for Trinity. Widening gaps in the Barnhall line and inconsistent handling left fertile soil for players like Alex Lynch and Martha Dwyer to make bold dashes for the Barnhall try line, but progress was slow and this purple patch went unexploited. A quickly taken penalty by Leahy on the half-hour mark eventually yielded Trinity’s first try, which was duly converted to narrow the deficit to five points. In search of an equaliser, DUFC occasionally allowed their enthusiasm to come at the expense of defensive discipline, and in any event the half-time whistle brought to an end their chances of an equaliser. Though quite uneventful, the start to the second half saw Trinity tighten up considerably. Barnhall, though, was not exactly diminished and maintained pressure on the hosts. Finally, they broke a stolid Trinity gain line, and after a protracted struggle near the try line, Sarah Haughian lunged out of a maul to place the ball neatly between the posts. Trinity’s misery was compounded less than two minutes later, when Orlaith Graham made a stunning run from the halfway line right into the try zone. She may have dropped it at the last moment, but she made no mistake moments later, diving home in the corner to give Barnhall a commanding lead. Lengthy stoppages, incurred by some heavy challenges on both sides, upset the flow of the game and stunted whatever momentum DUFC were hoping to build. An inexplicably lax moment in Trinity’s defence allowed Doran to grab her second try, and DUFC could count themselves fortunate moments later not to have conceded a fifth, when Barnhall’s Giena Halligan managed to drag with half of the Trinity team with her to the try line before finally coming to a halt. For the hosts, though, it was merely a prolonging of the inevitable, and two more converted tries for Barnhall – the first from Amy Cunningham and the second from Halligan – brought the score to 43-7. Trinity was now on the hunt for a consolation, and they got one in the final moments of the game when a jinking run from Honor MacNamara created the space for Niamh O’Kelly Lynch to crash over for a last-minute try. Moments later, the referee’s whistle called time on DUFC’s winning streak.